Hi everyone! I'm Reece and you may recognize me from such places as the carpet bag sewalong I guest posted here for Samantha a while back, or my website Happy Okapi (and if you're not a Simpsons fan, you may not get the reference and just think I'm super cheesy). 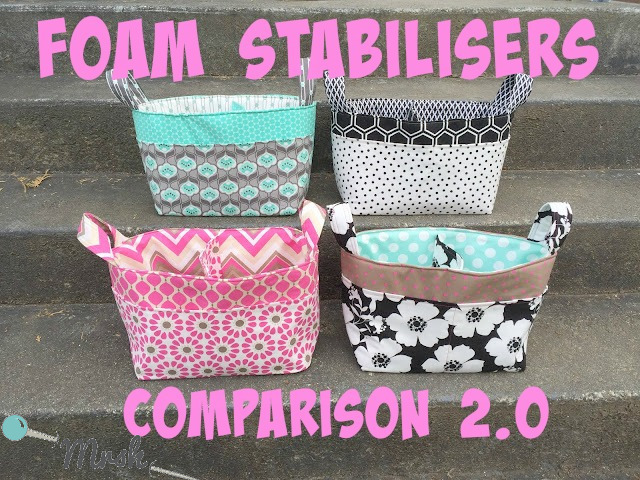 I really loved Samantha's original Foam Stabilisers comparison and recommend it any time people ask for advice on foam. Recently, though, some new foams have hit the market, and I offered to post a comparison 2.0, to include some of the newer foam stabilisers in the mix. I kept with the Noodlehead Divided Baskets and used the same brand of quilting cotton (all designed by Jackie McFee) for each basket to minimize any other variables. I'll be comparing: By Annie's Soft and Stable, Bosal In-R-Form, Pellon Flex-Foam, and Vilene Style-Vil Smooth Foam. I used all sew-in this time as I thought it would be a more fair comparison. 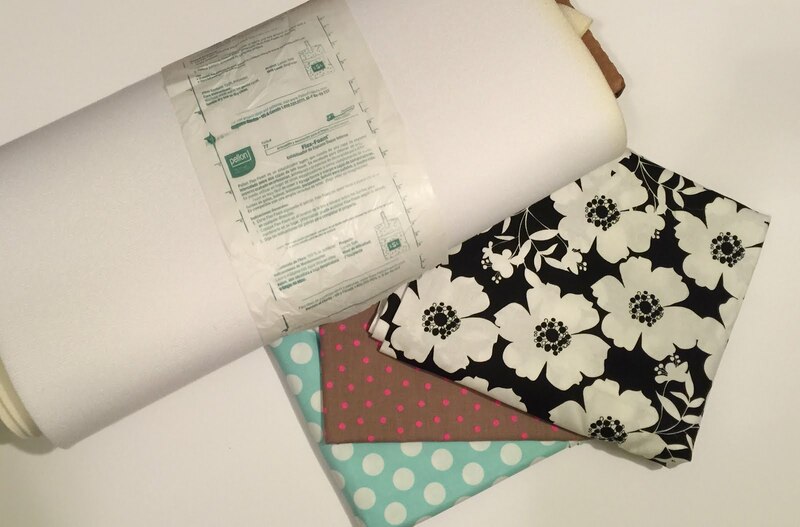 Many of the foams now come in fusible options; however, I've heard many people experience the same problem Samantha did with the fusible foam in her comparison: the creases don't come out. Each of these foams were designed to be used as sew-in stabilisers in bags or home decor projects. 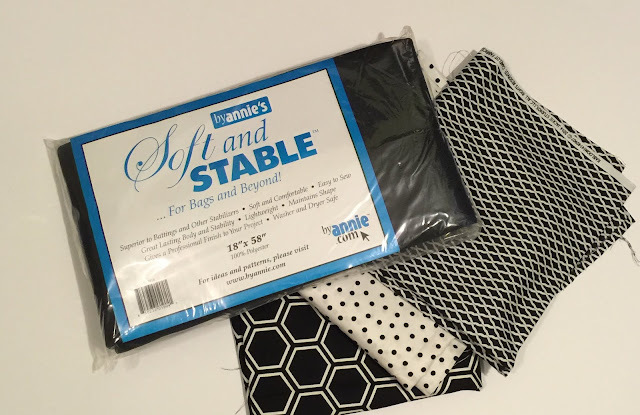 Vilene Style-Vil Smooth Foam: $11 for 28" x 20"
By Annie's Soft and Stable*: $18 for 18" x 58"
Pellon Flex Foam: $7 for 18" x 20"
Bosal In-R-Form: $11 for 18" x 58"
Vilene comes on a bolt, so this arrived cut to my ordered amount and in the shop's packaging. I paired it with these mint and grey fabrics. By Annie's comes in 2 different sizes, and the option of black or white. I've never used black foam before and heard it's good for making dark colours brighter, so figured I'd give it a go with these classic black and white designs. Pellon, like the Vilene, also comes on a bolt. I used a fun mix of fabrics for this one. 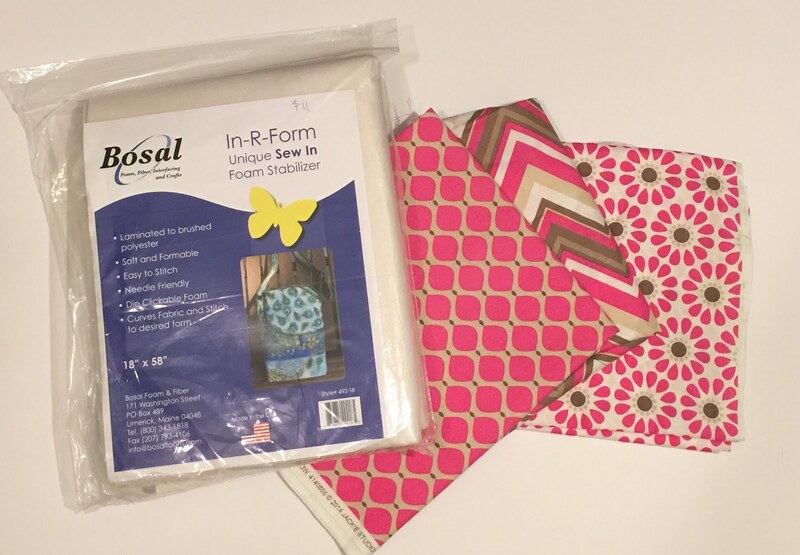 Bosal comes in different sizes, along with multiple fusible options. I chose the pink set of fabrics for it. They all seemed to have a strong smell when I pressed them, so I tried not to use too much heat with them. The Vilene in particular had a very strong chemical smell straight out of the package, but I don't notice an odour from any of the finished baskets. The Bosal has a papery-like look to it, and I was worried the creases would stay, but they pressed out beautifully. As you might be able to see in the picture above, the Pellon is beginning to yellow at the edges; it isn't very old and probably doesn't have an effect on the product, but it's not very attractive for now. I personally like working with narrower pieces rather than a large square shape because of the size of my work surface, so 20" wide bolts are easier for me. I know a lot of people prefer wider foam, so it's up to personal preference, but I thought I'd mention it because it may be something to consider. Because I chose all non-fusible, they each need to be secured to my fabric with a basting stitch with about 1/8" seam allowance. I have noticed that the fabrics actually adhere quite well to the foam even without the basting stitch (similar to felt sticking to felt), and I probably could have gotten away with skipping that step. I must say, I'm glad I did this comparison, because it let me see past my own preconceptions. I was rather surprised by the results. In order of crispness and stand-up-ability, from most crisp, to least: Bosal, Vilene, By Annie's, and finally Pellon. I think all the creases came out with pressing and I didn't notice a difference among any of the foams in that regard. 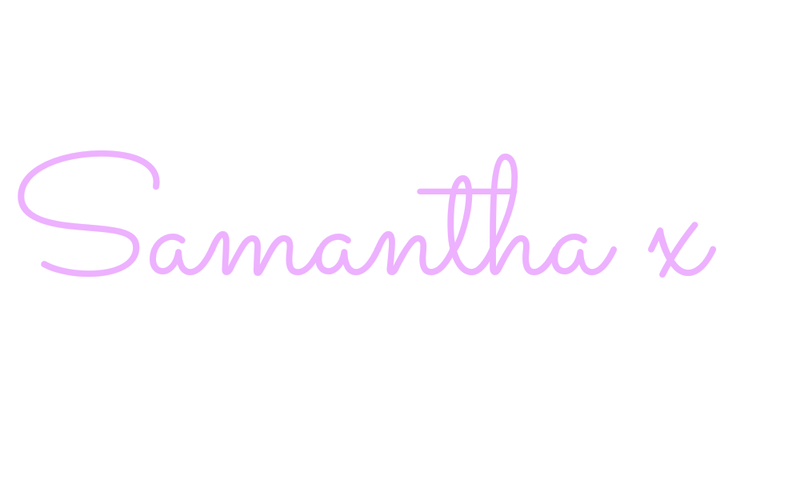 I loved Samantha's squish test, so I had to do my own. Here they are after I squished them (the Vilene wouldn't stay squished at all, even after several attempts). It looks like the Vilene (mint and grey) and Bosal (pink) switched spots for the squish test; I think the Bosal was crisp enough that it stays in whichever position it's put in. I like that By Annie's has a choice of colours, although I'm still not too sure it made a difference; either way, my black fabric stayed a vibrant black. This was my first time using Bosal and Vilene, and I was pleasantly surprised with both of them. One last consideration when choosing your foam is that you may be using the foam just to add depth to a quilted project, for example, and don't need it to stand up on its own. Lastly, I'll take another page from Samantha's book and suggest that you try a swatch paired with fabric if you're in doubt which is best for your project and really want to make sure it's perfect. I hope my comparison gives you an idea of the options out there. Here's one more look at them. You can find the pattern for the Noodlehead Divided Basket here. 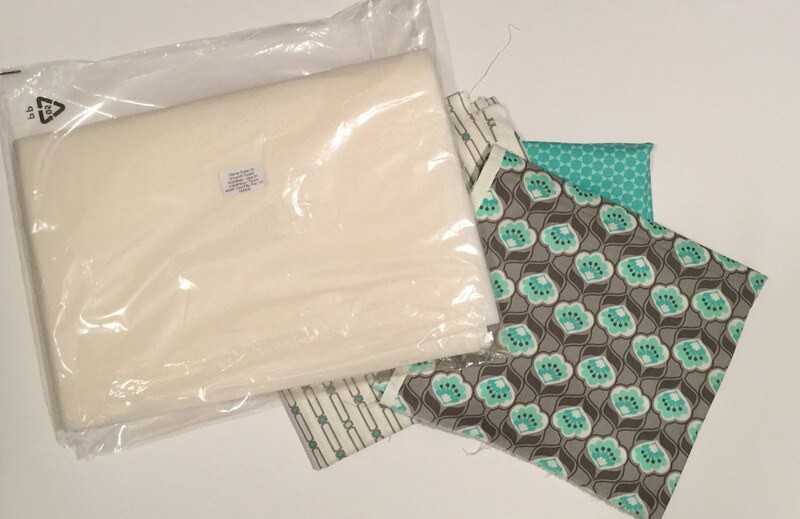 Jackie McFee sent me all these fabrics she designed to use however I chose; I thought they were perfect for this project.